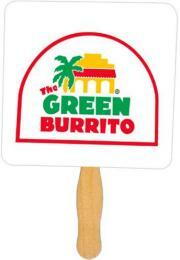 Custom Full Color Sandwich Hand Fans, Personalized in Bulk. Promotional, Inexpensive. Free Second Side Imprint. Best price in America. Bulk personalized sandwich fans, custom imprinted in full color (your color photo or unlimited number of imprint colors) on thick (24 point) glossy board stock. Budget Prices in the USA and Canada for wholesale full color sandwich fans . American clients don't pay taxes. Our inexpensive full sandwich fans are ideal for Political Campaign, Rally, Celebration, Church, Wedding, Club, College, Concert, Convention, Mardi Gras, Trade Show, etc. 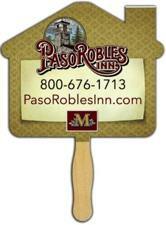 They come with wood handles and may be imprinted in full color on both sides (see the price table). Many shapes of sandwich fans are available at the same price: Square , Round, House (see pictures), Heart, etc. Prices include your full color imprint on both sides. Contact us for larger quantities. Setup Charge: $60.00 for both sides. Production Time: 5-7 days after artwork approval for quantities of 2500 or less. Fan type: Sandwich, it allows full color imprint over the entire area of both sides (not restricted on one side by the handle, as it is the case with regular fans). Imprint Method: Full color (4 Color Process). Imprint Area: about 8" x 8" on each side. Typical Production Time: 5-7 days after artwork approval.